HOW LONG DOES THIS QUEST TAKE TO COMPLETE? Is the prize worth it? Definitely! They are so cute and not too expensive. 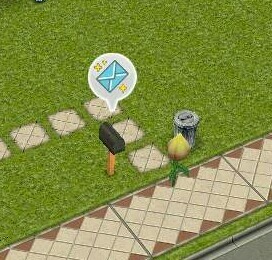 You can talk to them and they can do magic tricks (make your sim float) they also can find simoleons around the house! How do I start this discovery quest? 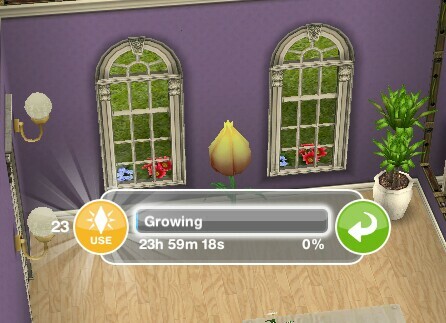 Does the time limit start when I click to build or once the building has complete? Why can’t I do this discovery quest yet? Can I do discovery quests at the same time as a main quest? Do I have to do this quest? I haven’t started this quest yet, will it still be available when I want to do it? There are no plates in the park to call to a meal, help! How do I catch the monster fish? What do you mean when you say a goal can be started early? What do I get if I complete this quest in the time limit? Where can I find the pet fairies? I haven’t built the pet store yet, will the fairies still be in there when I have? I have brought a fairy but can’t find it, help! What happens if I don’t complete in the time limit, can I still finish this quest? I didn’t complete in the time limit, can I restart the quest? Can I still get the prize if I don’t complete in the time limit? I don’t like this quest! Can I just skip it? Some times are slightly different on my game, why is this? Some times are really off/ different goals show for me, why is this? This quest unlocks the archery hobby, is there a time limit for this hobby? How many fairies can you have in each household? Is there anything that you can buy for fairies or dragons? Like how you can buy dishes and toys for the cats and dogs…? 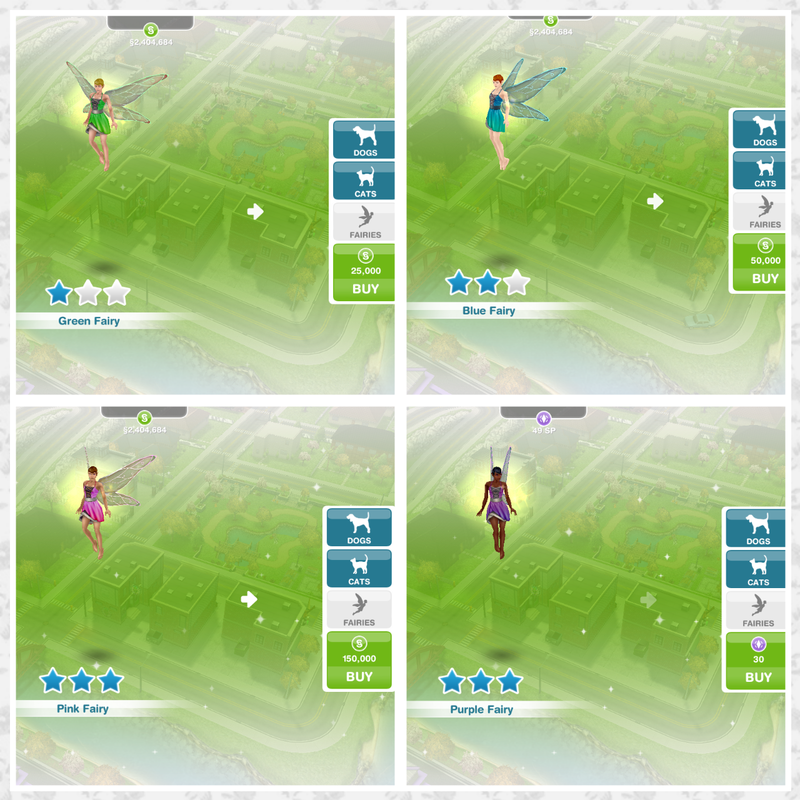 I am saving my social points to get the purple fairy, since I work hard to save my simoleons and LP to spend on pets. I also don’t really use social points for anything and I only have to save 15 more points and thanks to the in game freebies from watching 6 videos each day I don’t need to spend real money. Hi again weightless magic. 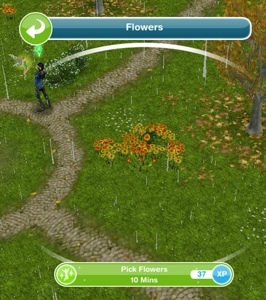 I was wondering if you know if it’s possible to take care of your Sims’ needs (like eating, using the bathroom, etc) when they are at the castle? I’ve been sending my Sim back to her house to take care of those things, but would love it if it were possible to do so right at the castle. Oh, also, is there a way to sleep at the castle, or is that something they have to go home for as well? Thank-you so much for your help! I have grown the beans and it didn’t go to the next step. What do I do? If the option is there on the fishing rod at the campground then yes you can. Can I Cook brisket in the park early? Hi! I love your blog! It has been so helpful. I have a question. I’m on the Royal Lineage Quest. Very last task is ‘Ask the Fairy about the bridge’. I’ve had both a Teen & an Adult ask the fairy & both have responded with the feet symbol. It seems like a glitch. I’ve turned off my device & restarted. I contacted support (through Firemonkeys), but my request won’t go through. It keeps telling me to recheck my email. (I have & it’s correct). It’s very frustrating because I know this should only take 5 seconds & the quest would be done. Any words of wisdom? Has this happened to anyone else? Thanks! Sorry but there isn’t much I can do as I am unable to fix technical issues, this appears to be a glitch in this latest update so you would need to contact EA to get this fixed, can you try a different email address? When I try to ask the fairy to open bridge, she doesn’t, but instead I’m getting footstep symbol. Plz help! I also wanna say thank you for this blog, very very helpful! It seems like a few people are having this issue, try restarting your device and then send a different sim to talk to the fairy. If this doesn’t work you may want to contact EA to see if they can fix this issue for you. Ok, so.. I wasn’t able to complete the quest in time. Am I able to hold off on completing the quest until it comes back around again with the ability to have fairies as pets? Or was this my only shot at getting them?? If you didn’t complete in the time limit you will be unable to get fairies. Do footprints appear when you try? There seems to be a glitch on the latest update with this, you will need to contact EA to see if they can fix this problem for you as I am unable to fix technical issues. Sorry but I cannot update this if no one tells me all the parts that have changed! 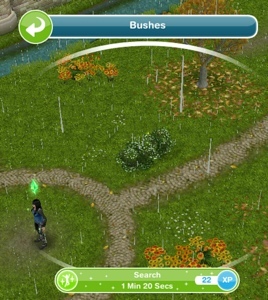 Are you using an adult sim? If you are maybe try with a different sim to see if this will work. Is your sim at the castle? I have build the castle its asking to complete the gesture quest how can i complete .